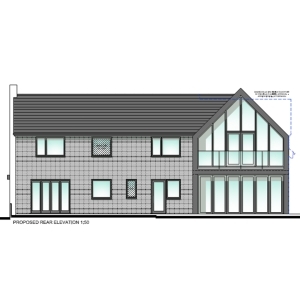 East Dorset District Council: Pure Town Planning are delighted to announce that they have recently secured consent for alterations, extensions and remodelling of an existing dwelling in Verwood, Dorset. Plans were designed and drawn by Jon Holt of Watts Holt. The client had previously secured planning consent for a modest two-storey side extension to their dwelling. Despite this consent, the client considered that a more contemporary approach with a subsequent remodelling of their 1970s dwelling would be more appropriate. The client came to us with a full set of plans ready for submission where we got to work on our accompanying statement. The statement justified the design of the scheme noting the existing property currently makes little positive contribution to the surrounding built and natural environment and the proposed plans will make a considerable improvement to both the site itself and the wider area. Along with justifying the scheme in terms of the design, the statement demonstrated that there was no material difference in terms of bulk, mass and layout between the extant scheme and what is proposed. During the course of the application, a neighbour objected claiming that this extension would cause harmful overlooking to their property. Pure Town Planning quickly responded with a full and thorough rebuttal showing that due to the distance and oblique angle that there would be no harmful levels of overlooking possible. Subsequent to the rebuttal, the Case Officer recommended the application for approval within the 8-week target time frame without any alterations to the submitted plans much to the delight of the client. So if you have found your dream location and now need a ‘forever house’ to go with it, why not call Pure Town Planning on 01202 585524 or email info@puretownplanning.couk for a FREE 30 minute consultation on how we can get you that all important planning permission.